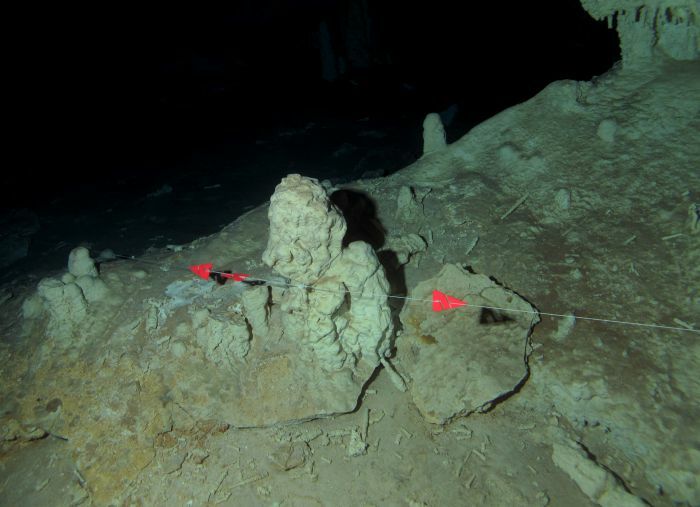 From the influence of natural contexts on the choice of methods of docking of the Ariane wire in underground diving. From rifi line... to the land of cavernophiles! 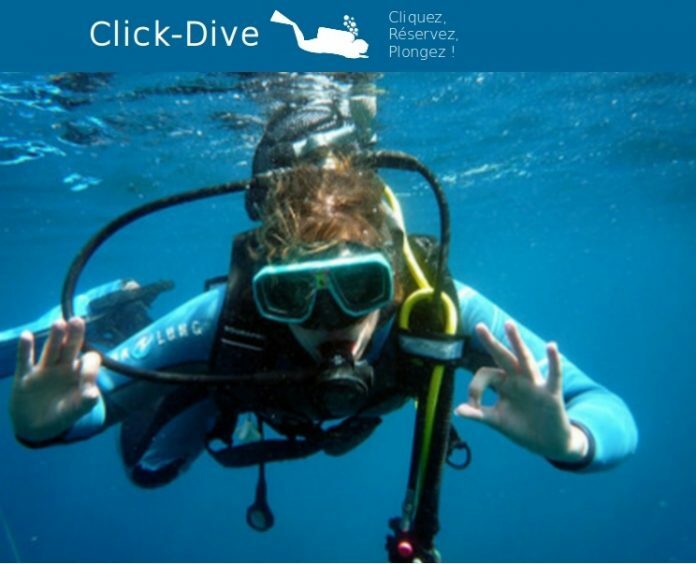 The current enthusiasm for underwater diving, stimulated by digital communication, its development beyond the circle of passionate explorers, has globalized information, techniques and knowledge. Practitioners from the same activity, working in distinct areas of the planet, discover different, heterogeneous approaches, techniques and materials. 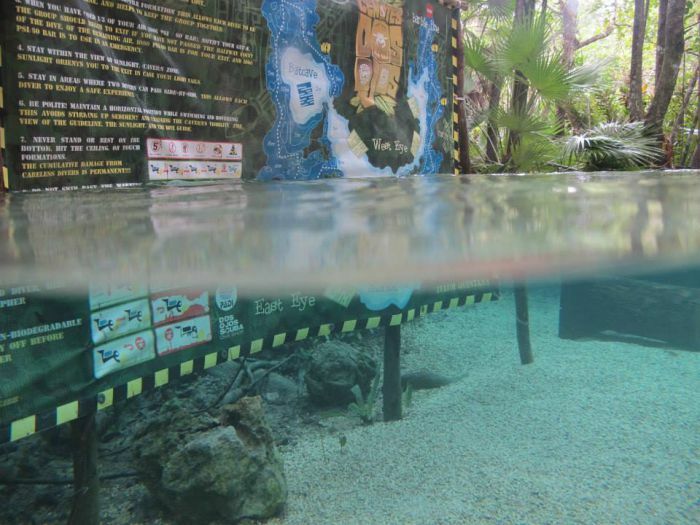 This is all the more so since underwater diving is practiced in unbounded natural environments, subjected to indigenous climatic influences and dependent on an inherited geology. One could think of these distinct, antagonistic, opposing approaches. This would obscure the common ground, which was unanimously adopted. The use of a guide wire is. Many technical aspects relate to the thread. The object of this prose will be limited to the methods of mooring, fractionation. Participate in orientation (directional markers, distance indications, crossing markers). However, under the field, in practice, the approaches diverge, the techniques differ according to whether one plunges in Europe or on the other coast of the Atlantic. In the Caribbean area (Florida, Bahamas, Yucatan, Dominican Republic, etc.) and in Australia, the yarn is moored directly on the concretions and the rocky asperities on the rock. 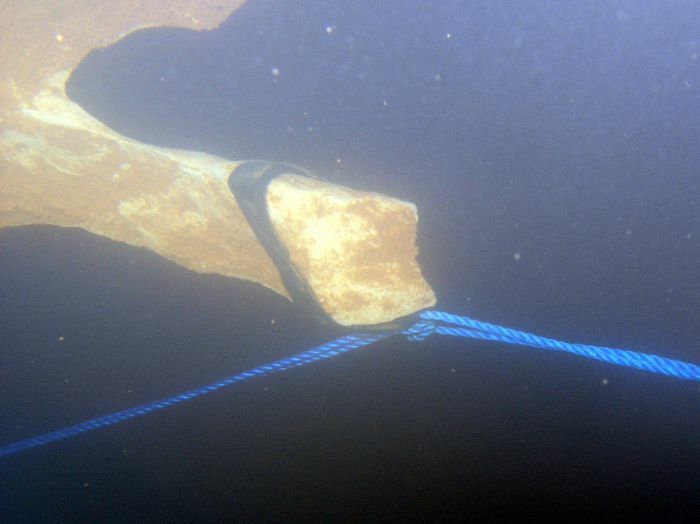 In Europe, the contact of the wire with the rock is prohibited, the divers install intermediates which absorb the stresses, the tensionings: the famous elastic tubes. They avoid shearing by abrasion on the rock and contribute to the durability of the thread. Why is that ? What interest would these curious uneducated palmipeds have in unmatching their methods? Would one prevail over the other? Would the new continent sacrifice the longevity of the equipment to the speed of installation? Would the old man be trolling, refractory, and hostile to any form of salutary evolution? Would it look cheaper compared to a trend more "fashion"? A wise approach to, or rather, natural environments, contexts of practice provides some elements of understanding. 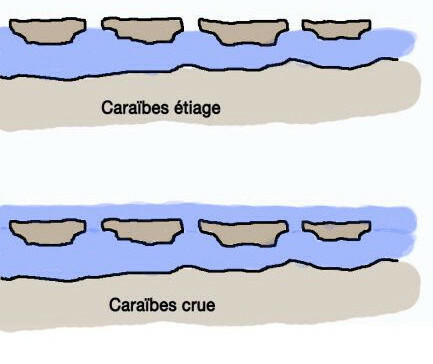 The difference in age is illustrated by the primary porosity of the rock (20-25% in the Caribbean arc), which is much higher than the Mediterranean ones, especially in Jurassic rocks (1-5%). 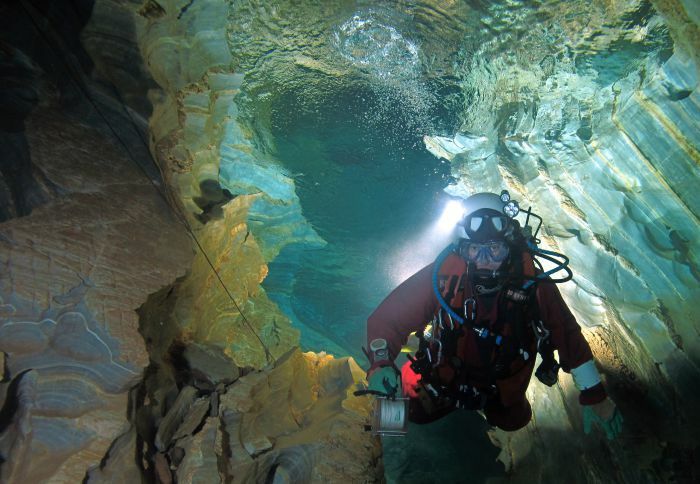 The structure of the karst itself has nothing to do with it. 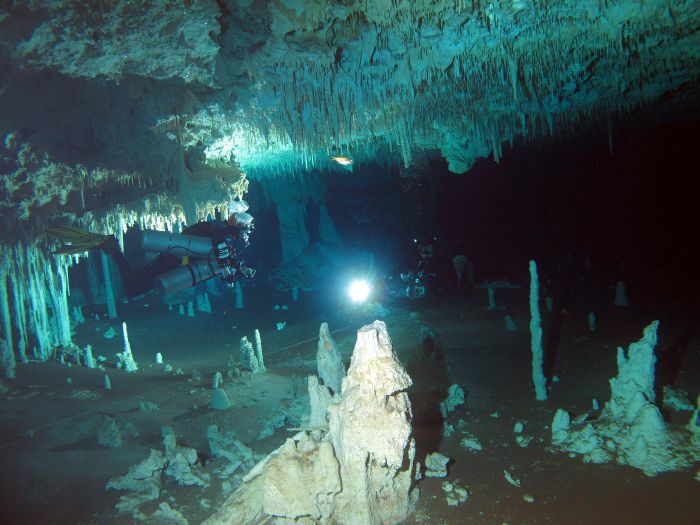 The caribbean karst is low (less than 15 meters above ground water level, 50m maximum at the center of the Yucatan peninsula), whereas in Europe it is common for the massifs Culminate several hundred meters above the base level. In Florida, soil cover acts as a wet compress. 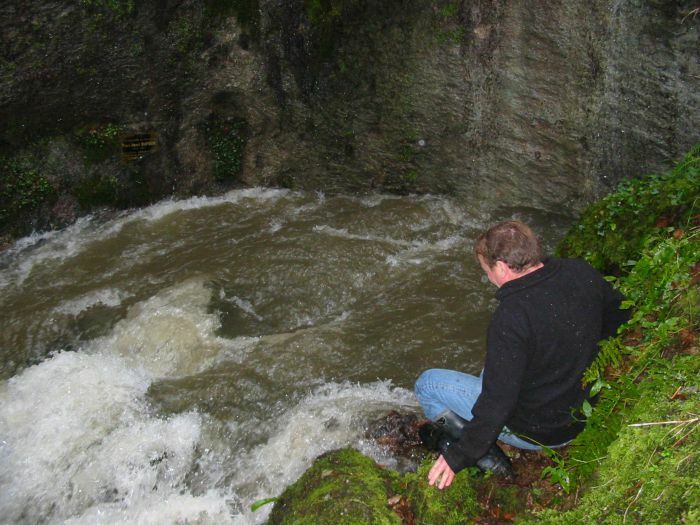 Rainwater, instead of trickling and infiltrating immediately as in Europe, is conserved in superficial soils and percolates more slowly through the karst. These combined parameters will influence flood events during rainy periods that increase the amount of water in transit in the karst. They condition specific mechanisms because they are linked to a particular hydrogeological context. The limestones in which the caves develop are not the same age. They belong neither to the same eras, nor to the same periods, nor to the same series. The Jurassic rocks of the Mediterranean are older than those of Florida and Yucatan, as shown in the table below. 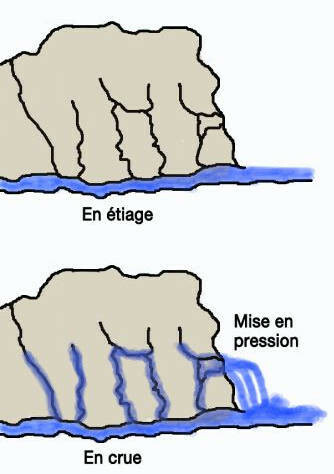 In Europe, when the size of a source is insufficient to absorb the volume of water entering the collector, the level rises, the water invades the usually dry galleries and builds pressure in the interior of the massif. These loads regularly reach several tens of meters, when they do not exceed the hectometer. The pressure that is exerted in the ducts, on the equipment in place, double, triple, tenfold. This pressurization generates a violent acceleration of the flow velocity, of brutal turbulences which impose vibrations on the Ariane wire, in particular at the level of moorings. A flow has a transport capacity, correlated with its flow. In flooding, the material conveyed degrades the visibility and can also become very abrasive in the image of the greso in the dolomitic zone. This violent, turbulent circulation degrades the wires of Ariane in place, sacking the equipment to the point of sometimes cleaning the cavity of their presence. Tests with caving ropes (11mm diameter) were hardly convincing in the long term, in the cavities where some floods reduce to nil the work of preliminary equipment. In the long run, the diameter of the wire does not guarantee its longevity, it is rather the quality of the equipment, the positioning of the guide in the gallery, out of contact with the walls, sheltered from areas of major flow where Sometimes fly the pebbles, which ensures it in the short or medium term. 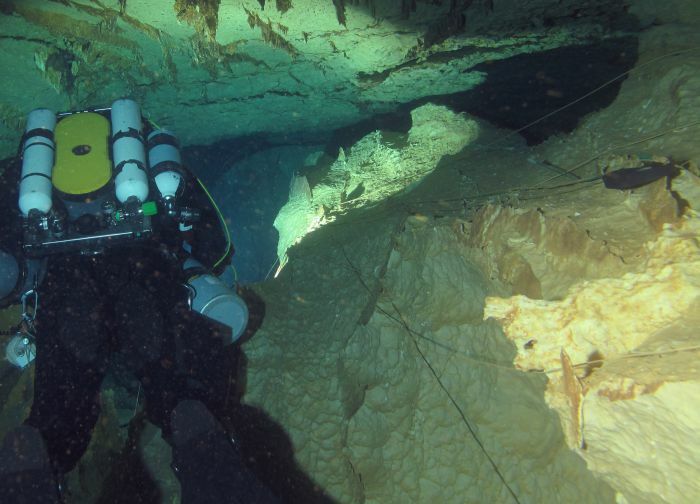 As a result, European divers sometimes opt for cavities where the synthetic lines do not support the flow regime, for sheathed metal guide wire commonly referred to as a "cable". These guides with a metal core have been satisfying for more than a decade in some sources where each flood deteriorated the nylon wires in place. In general, Caribbean karsts operate according to diffuse drainage mode (recent porous limestones + sometimes thick furniture covers). The flow velocities are generally lower and especially, the loads are much less violent. When the size of a source is insufficient to absorb the volume of water entering the collector, the level rises to the many access openings on the surface. Due to overflow phenomena, loadings are limited to a few meters since the water reaches the surface quickly to dump and flood the exterior. This dampens the loading, the motor of the flow, so that the floods are slow and proportionally small. Added to this is the high porosity of the rock, which "absorbs" the violent pressure surges with part of the water that can be stored by these limestones during heavy loads in the ducts. It is the environment, the environment that the underground divers frequent that guides their technical choices, determines the techniques of equipment in wire of Ariadne, motivates the differences of approach two sides of the Atlantic. Confronted with elements, environments and manifestations, parameters and conditions different explorers have developed techniques, have adapted accordingly. This is how the intelligence of men is illustrated in their ability to adapt and evolve. For example, the use in Europe of the Caribbean technique for the equipment of temporary yarns. Faster on the go for the installation of the line, as well as the equipment to rewind, it is gradually adopted for provisional equipment. Another parameter, technical this time, corroborates the diversity of modes of equipment. This is the topographical survey technique, based on measurements on the previously measured yarn in Europe. Each mooring in the rock, around the promontories, dedicates a length of wire, which inevitably distorts the footage. But this, as Kipling said, is another story. Wanting to define a preponderance of one method over the other would here be deleterious, out of subject, incoherent. Who would consider opposing the technique of a Senegalese fisherman to the practice of the Inuit who pierce the pack ice to bait? To impose on a Vietnamese fisherman of the Bay of Along a method developed in the Feroe Islands? Dolomitic grèsou: very fine sand. Karst: limestone region, modeled by chemical dissolution of the rock. Substrate: base on which rests a geological layer or vegetation.